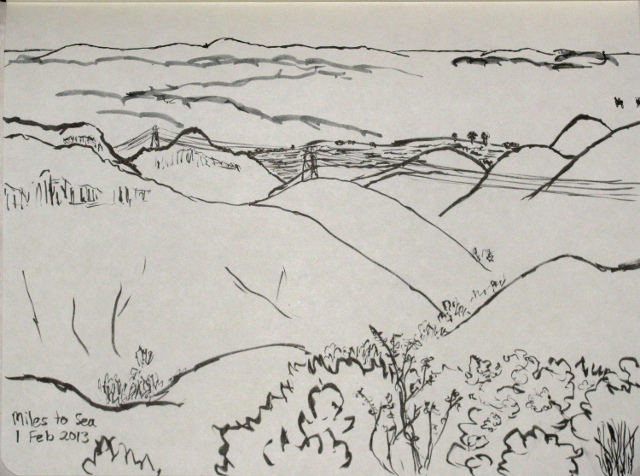 The hills and valley heading down to the ocean from Camino Cielo. A little bit more of waiting on Camino Cielo. 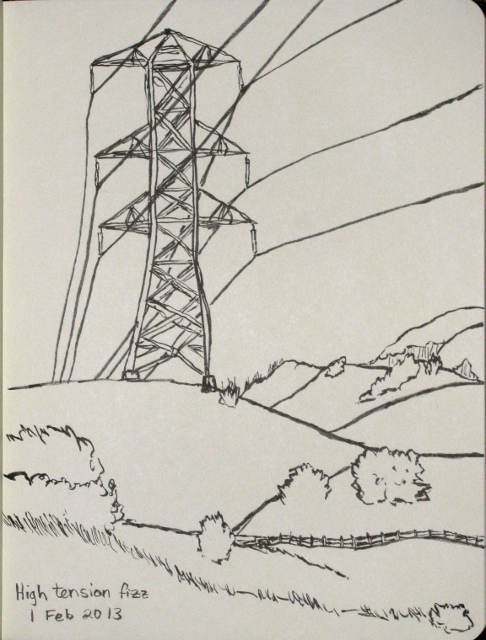 One of the many towers that carry power over the mountains near Camino Cielo. 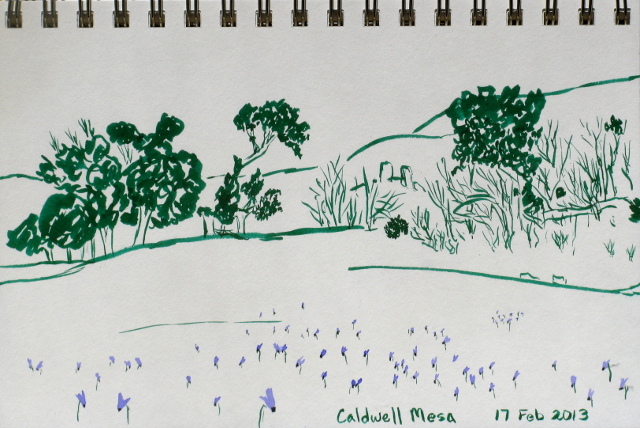 A look toward the rocks of the spring sitting out in Caldwell Mesa. The morning was clouded over and looking a bit too much like the weatherman might have been right, but that first round of clouds started to burn off as the sun got higher. 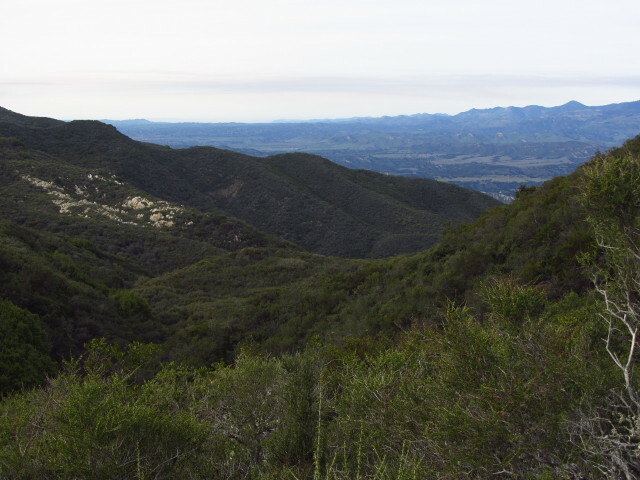 I headed up the road to the top of the ridge where the Caliente Ridge trail, an old road, starts. This is the only trail listed on the monument's web site that is over one mile in length. 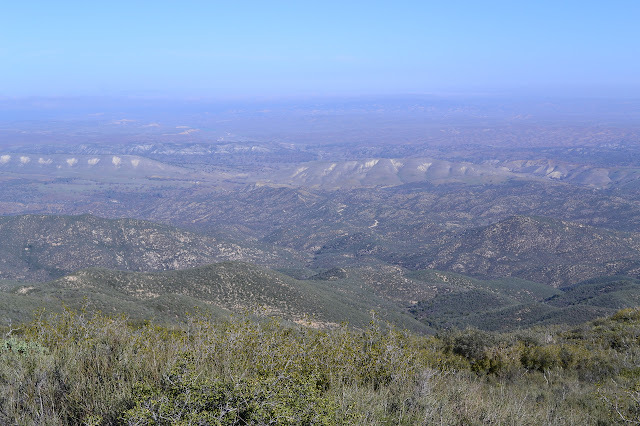 This one is 8.5 extremely easy miles to Caliente Mountain where there are views and the remains of an old aircraft lookout from WWII. 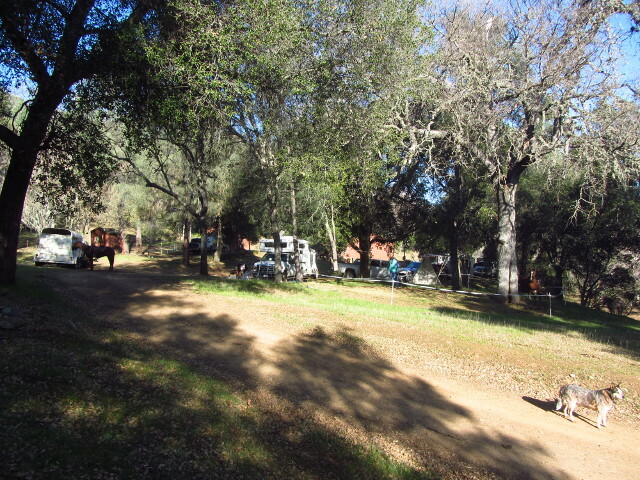 Some also start at Selby Campground, continuing on the road out the back of the campground. 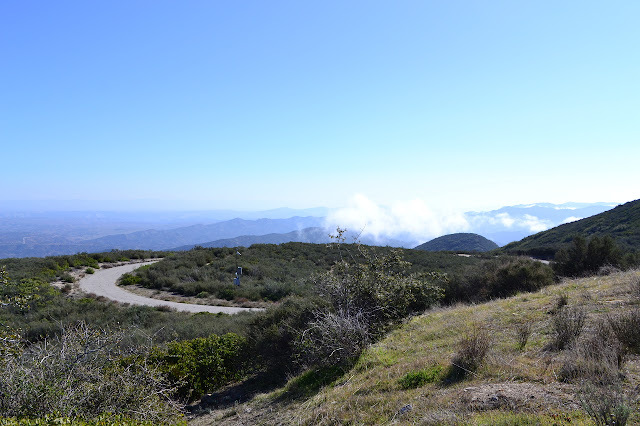 This road quickly becomes a trail which climbs up to the public road near where it reaches the ridge. For an even greater challenge, there is an access trail that starts down on 166 although it is unclear what it connects to from the monument map. 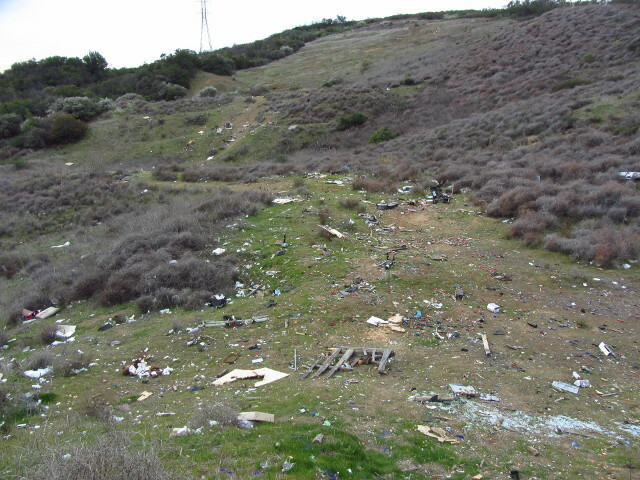 The road continues down the ridge on the other side to 166, but does not allow public access that whole way. A look out over the canyon to the south from up on the ridge. Overlooking the Carrizo Plain with Soda Lake (upper left) and Selby Campground (lower center) and the clouds that never quite burned off. This is one of the generally short established hikes in the monument. 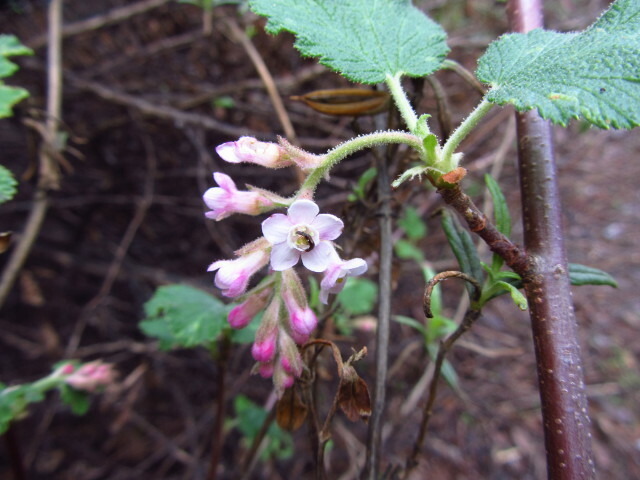 The attraction of Wallace Creek is not in its picturesque nature but in what it shows about our environment. 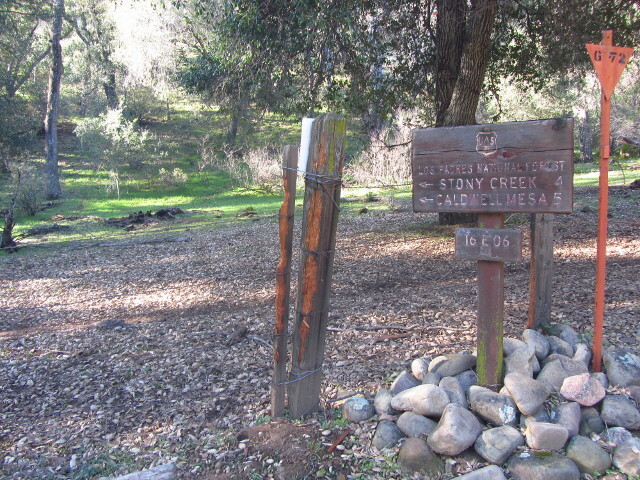 The creek crosses the San Andreas Fault and when the fault slips, the upper and lower sections of the creek move apart. The hike starts at a small lot beside the road where brochures discussing the fault movement and how this creek shows it are available. 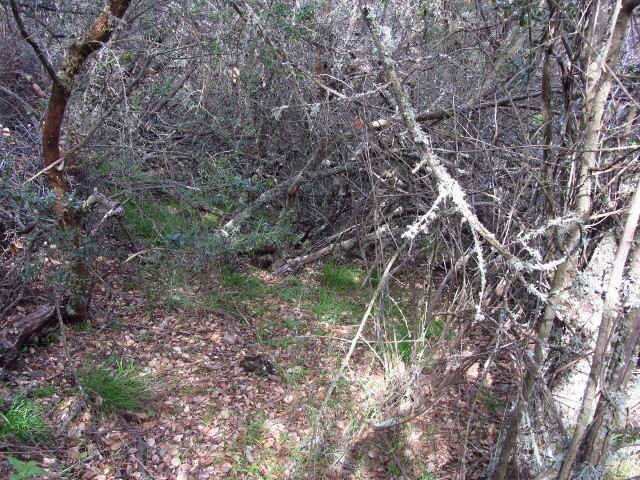 A short walk brings one to the upper section of the creek and the fault. 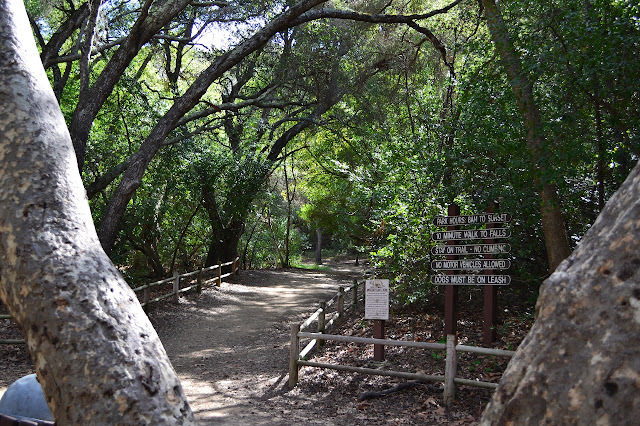 The short trail from the parking area to where Wallace Creek crosses the San Andreas Fault. 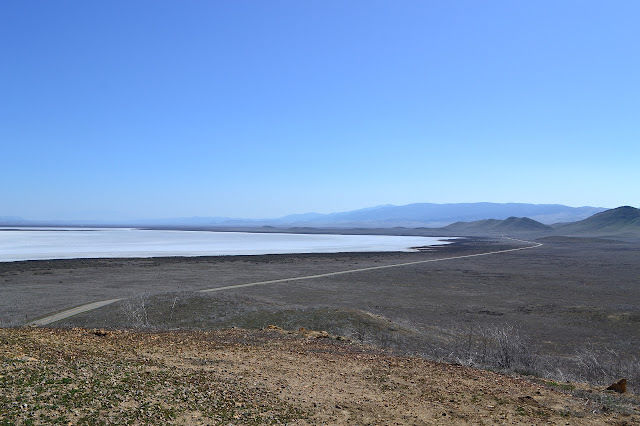 The generally dry lake bed of Soda Lake is at the north end of the Carrizo Plain. 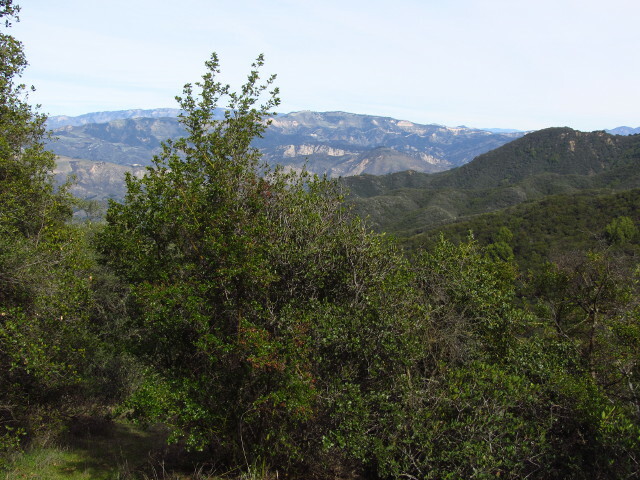 There are six established hiking routes in the area, although all but one of them are less than a mile long. Two of them are devoted to having a look at Soda Lake. Roads also go all the way around the lake, so there are many more vantage points. There are a couple hills that seem to rise suddenly out of the flat plane. This one near the road has a parking lot around the back and a short path up to the top past two informative signs. At the top, the expanse of the lake is easy to see. I got to the top to see that it was very clearly dry. Not even a little puddle of liquid out there anywhere. It really ought to be getting to its soggiest by now, but there is only salt resting in frozen waves. The southeasterly view of the very dry salt flat in the middle of the plane. There wasn't really much planned for the third day of work. Really just breakfast and a general dispersal finishing with the changing of the combination. 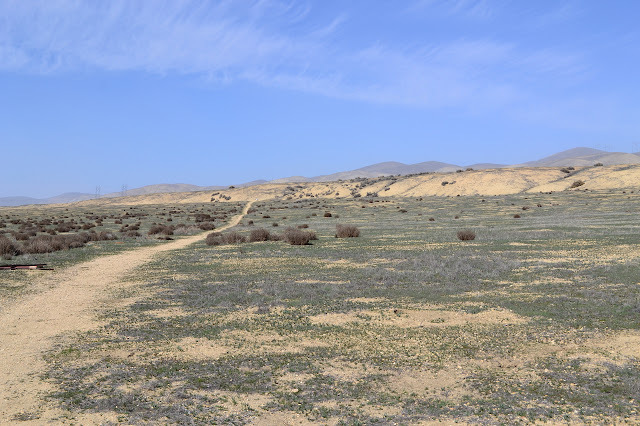 My plan was to head over to the Carrizo Plain National Monument to poke around for the day and eventually stop at Selby Campground to hike the Caliente Ridge the following day. First I had to get there. 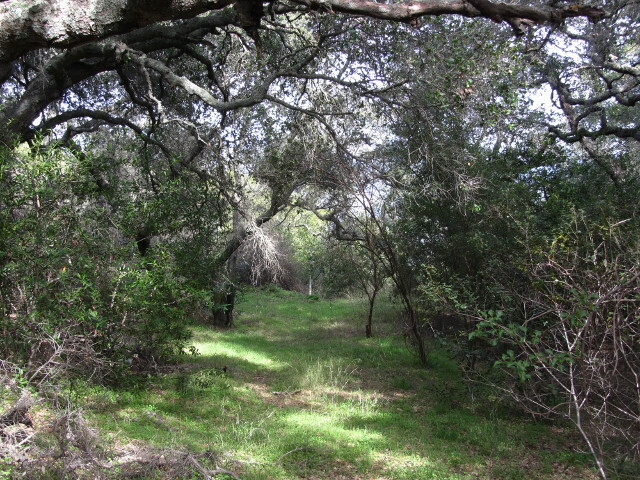 I headed out along Pozo in what should be a shortcut to east 58. It is very nice unpaved road up a lovely canyon and down and around. At some point I went north where perhaps I could have gone east and got onto the Red Hill Road, which didn't look so good. It had deep erosion cuts down it leaving perhaps enough room for a car to the right, but if not would happily swallow up my wheel. I chickened out of it and headed west instead. This road also has some annoying spots, particularly in the short stretch that it shares with an OHV route, then came to a paved road. Suspecting it would just go up and stop, I turned north and drove it, mostly up, until it stopped. There are some nice views along the way as well as a few trails. Sharing the summit of Black Mountain with a funny looking FAA site, I took in the view. The last twist of the road to the top of Black Mountain. A little weather was moving in. The northeast view from the top of Black Mountain. 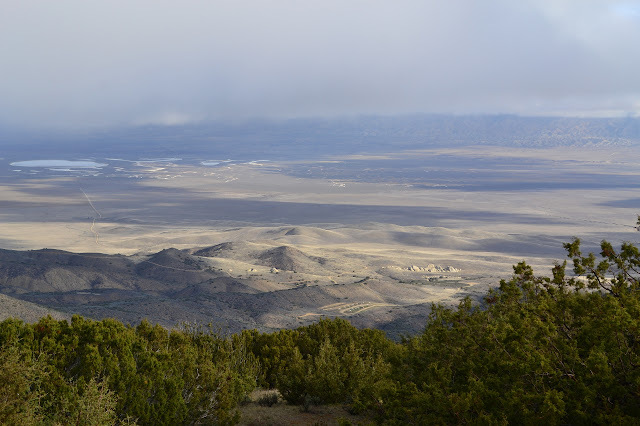 Then I followed the paved road back down for the very long way around to Carrizo Plane. The Backcountry Horsemen of California Los Padres Unit put together a three day event of trail work on the ridge down from Caldwell Mesa and adding a sign along the route and invited the unaffiliated along to participate. It would allow me to check out a new area and do a little trail work, so I signed up. Apparently there were a few other hikers who signed up, but I ended up the only one who turned up. Saturday was only arrival at the old Avenales Guard Station and a bit of reconnaissance for the work with a bit of dinner and dutch oven cobbler (mostly blueberry and all delicious). The station has had a lot of work put into it and is now a residence of one of the BCHC members who serves as caretaker. With lock code in hand to get through the gate (permission is needed to come here), I arrived in the afternoon and met a few of the crew as people filtered back in from riding. Sunday was the main work day and I started it trying to close my bag and bivy against the determined nose of the youngest of the many dogs who really wanted to play. He quickly got distracted and I could get up in peace. We all dug into a breakfast that couldn't be beat and I started off a bit earlier than the rest to get to the mesa about the same time. A view of the Avenales Guard Station surrounded by trailers and dogs and people readying their horses and mules. Passing through the gate and out onto public land with a few miles to go before work begins. It's really a half mile shorter than advertised. I am not certain if we have ever gone to Nojoqui Falls as a specific destination, but we have often stopped by on our way to or from something else. The park is a few quick turns off the freeway and the waterfall is a few quick steps up a wide and easy path. I have been wanting to stop by it, but always seem to be going by after dark or wanting the little time it takes for whatever else it is I will be doing that day. Driving up to SLO to camp out and then work on Sunday gave me the perfect moment to stop by. My sister has taken to stopping by so often that she was driving off when I got there and had to come back around to make sure I knew it was her nondescript white pickup and not just any nondescript white pickup that was leaving. I grabbed camera and water and started up it in my sandals. Walking on dirt in these stone catchers almost always causes regret, but not on this trail. This trail has been worn into a paved like surface from the traffic. The park is open from 8 AM to sunset and dogs must be on leash for this short and well trod trail. 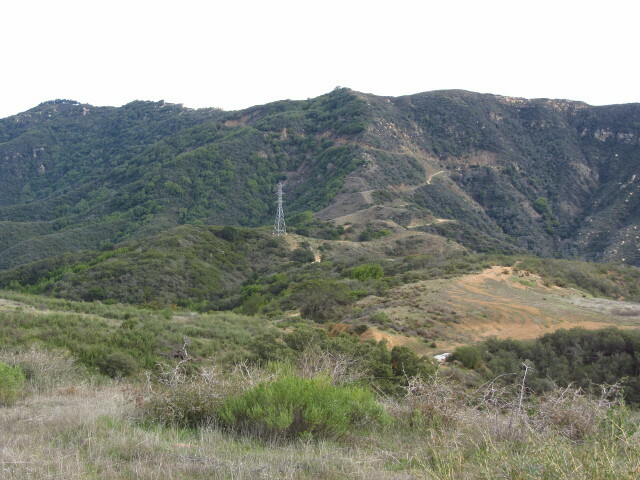 I went out to see the waterfall in Escondido Canyon in Malibu again, joining a very large group of HIKEtheGEEK folks. 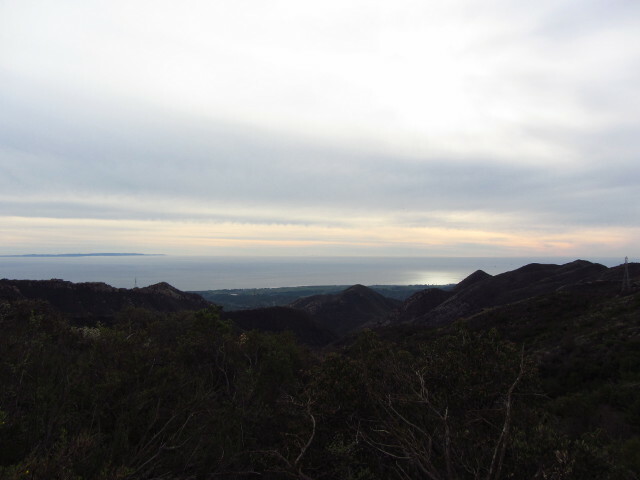 The clouds over Malibu were looking very threatening, and thickened up as the group gathered, but weren't expected to deliver any water. Underneath them was feeling very cold for the middle of the day in southern California. I got a little history on the trail. The parking lot has only been there about six years and was put in to decrease the crazy amount of parking on PCH and a government agency had a little square of land there. No parking signs keep the cars off the side of the roads and the lot fills fairly quickly, so there is still plenty of parking out on the highway and it still gets a little crazy. 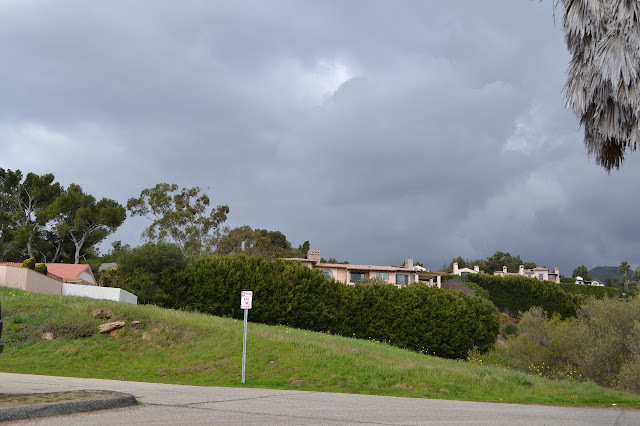 Thick clouds building over Malibu and the no parking signs along the roads. The monarch butterflies come each year and stay for a few months. 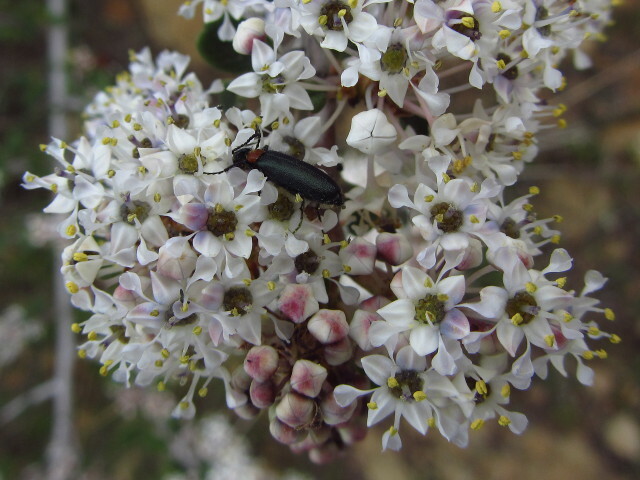 The peak for this year has already happened and was not nearly so impressive as the one last year, but there are still quite a few hanging around in the blue gum eucalyptus grove. We went out to Ellwood to see the colony that stops there. 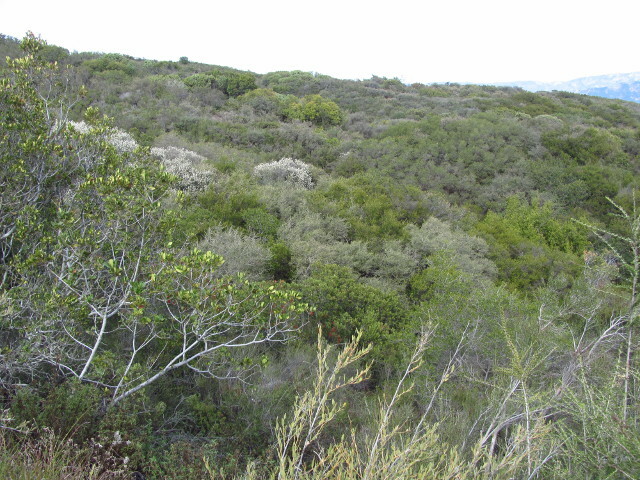 There are a few entry points to the Ellwood Bluffs area and we started close to the butterfly preserve area. There are three signs near the beginning to inform about the butterflies and a well established trail leads from there to the grove where they flock. There are a few trees in bloom, but otherwise not so many flowers. 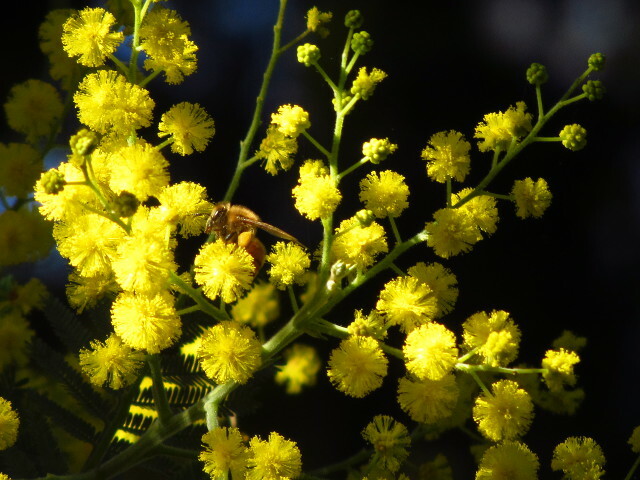 A hungry bee taking advantage of the flowering trees and getting heavy with pollen as it does. We crossed a little wooden bridge over a stream bed that was soggy in places, then some planks over a bit more puddled water into the grove. At first, there are a few butterfly shapes easily spotted fluttering between the tree branches. 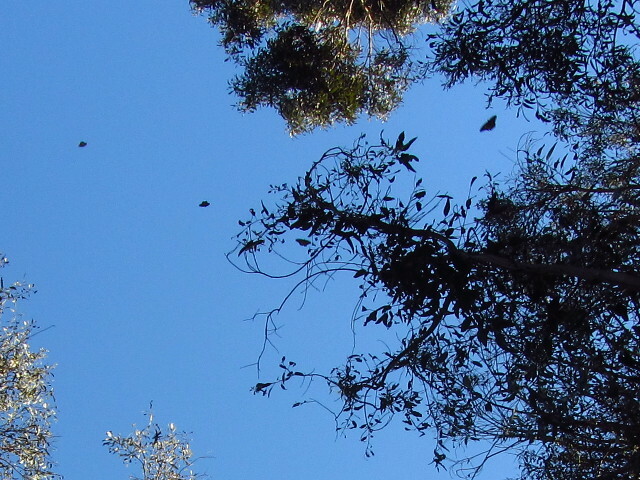 The dark shapes of butterflies against the sky are easily spotted when looking up at the edges of the eucalyptus grove. Locate the (non) trail head. Sometimes I find a dotted line on whatever USGS quad I'm staring at at the moment and then try to look it up to see what people say about the trail. 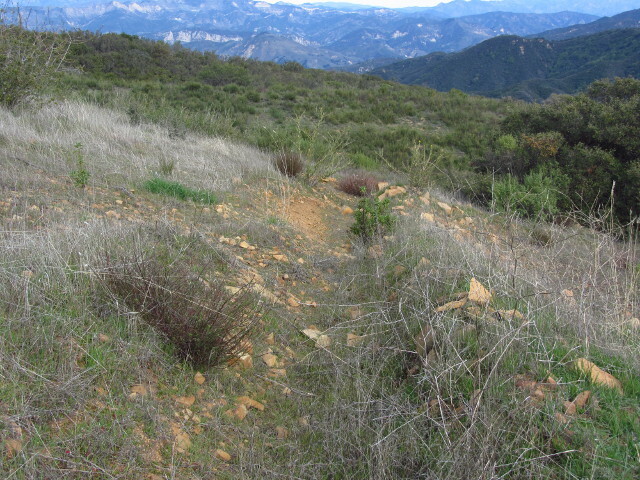 Usually I find something, but for the line heading down from Camino Cielo along the side of Hot Spring Canyon on the 1995 Cachuma Lake 7.5' quad, I could find nothing. This quad has a few dotted lines along ridges that could really be fuel breaks rather than trails, and this shows some tendency to the ridge line. Still, those other lines were on the older maps and this on is new to the 1995. 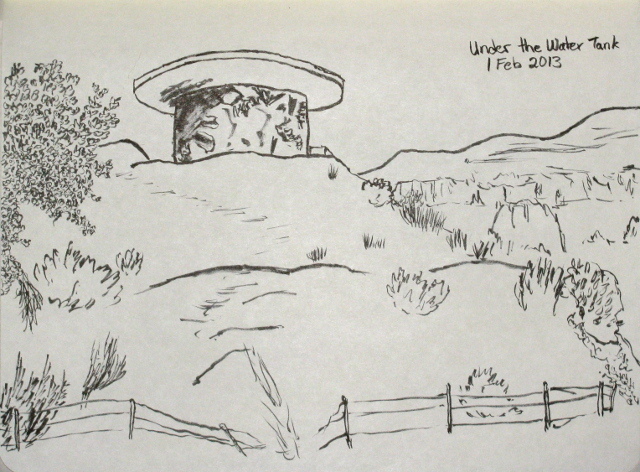 This one doesn't have a name or designation, which doesn't bode well for its reality, but the trail next to it that serves a well in neighboring Bear Canyon also has none but is likely real. At some point, one will never know unless one has a look. To that end, I decided to go do so, then it rained so I had to wait for the rain to finish and decided it would be a good plan to let the road dry out a little too. Once dried out, the road still seems to be rather poorer than it was in November, but found a route through the mess that worked out. I parked, rather badly due to a compulsion to park at the edge of the space rather than simply off the road, under the water tank by a closed road to take a look. I called AAA, who said they were coming and did a couple sketches waiting before calling again to find out they weren't really coming. Yeah, the parking was that bad, I dropped the front right tire in a culvert. I called for some different help to come later, then headed out for the poking around. A pleasant stroll under the oaks to start off the route. 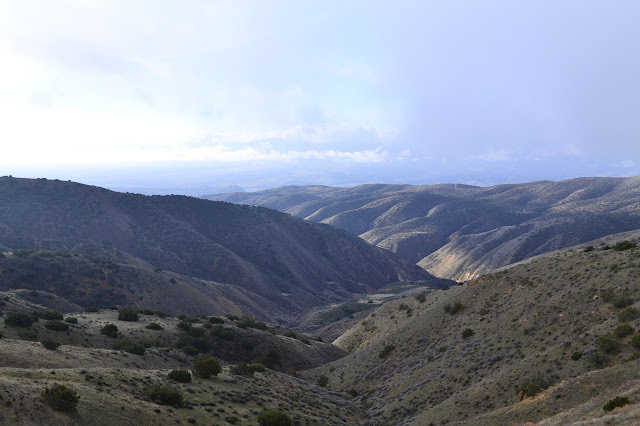 The closed road below the water tank isn't likely to be the route down the side of Hot Spring Canyon, but it is a spot with easy parking and an obvious trail heading down it. I might as well give it a quick look too. I started down finding it to be a very easy route at first. It quickly shrinks to a trail that leaves the old road bed to head around some growth, then joins again. After that, it shrinks again requiring a lot of crouching but no crawling required. And then it just ends. A much smaller bit of trail that requires crouching to continue down. It looks like the route is being kept open by the random people who go to take a look when they are using the upper areas for whatever they like. You know, tagging the water tank, shooting at things outside of the sanctioned shooting range areas. I found a cigar wrapper at the end of the open trail, so I suppose smoking as well. There are some nice view spots along the way, although somewhat obscured by the vegetation. 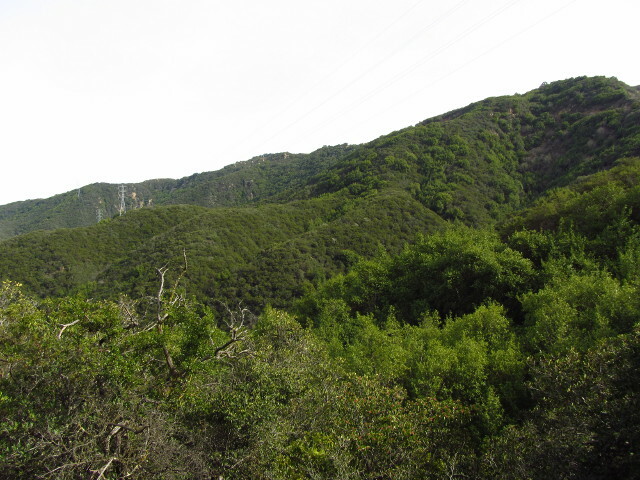 Looking east along the ridges that drain into Bear Canyon. A bit of the mountains to the north. I headed back up again, satisfied that there wasn't anywhere to go. I'd got about 0.3 miles down. This is probably half way to the well. There are starting to be a few more flowers out there. 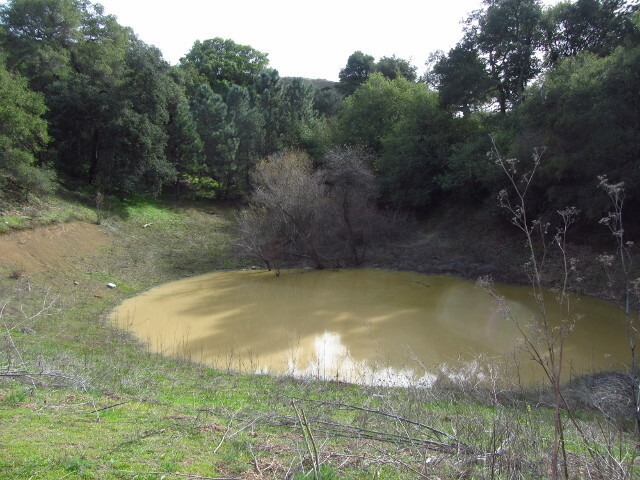 The natural pond shown on the map near the start of the old road to the well. I started along the road looking for another trail headed off to the north. From the locked gate, it should be about half a mile to the trail. Once in the correct general location for a trail, I couldn't fine any. 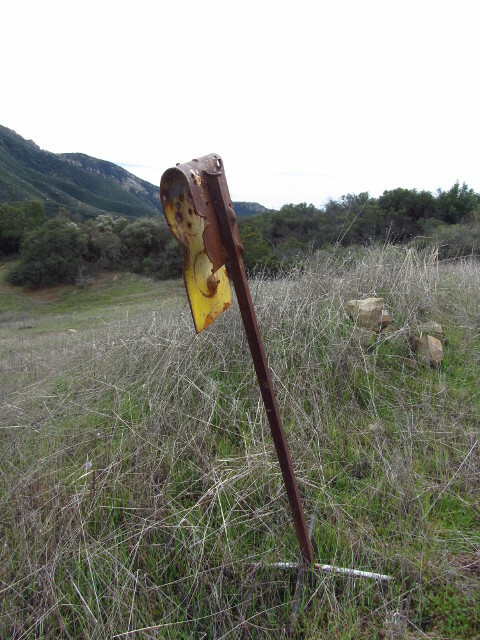 I did find a sign saying it was a fire line restoration area, a hint that there may have been a fuel break here that is no longer maintained. Further on, trails lead up to the top of the local peak. I headed up those instead. Some lines through the brush can be seen where there might be a trail, but they are not trails. There are plenty of cuts like this on the hillside, but they are for directing water flow away from the road. None of them are trails. Camino Cielo stretching to the east from one of the small peaks along its side. The ocean with a little bit of marine layer giving it texture. I headed down again, trying to intersect where there should be trail, if there is trail. I found some bit of path, but following it lead quickly to thick brush. I tried some other routes, but always came to brush. I followed the path back to the road, trying a little more to find trail. I crossed the road and took a path that would intersect where I'd seen a trail with a sign on it heading south. Nothing is on the map, but I might as well look at it too. It turned out to be another cut for drainage and the sign is just a yellow rectangle. A sign along what looked like a trail, but turned out to be nothing interesting. I continued back through the fairly open area that is currently used as a shooting range although it looks like the sanctioned areas for that are further east or west. More blooms accompanied by some wicked spines. The litter, mostly broken glass but also computers and furniture, of many many rounds of shooting. Back at the car, I set to removing it from the hole with jack and the pointy end of the lug wrench. Two out of two Jeeps were not carrying a shovel and neither do I, so the lug wrench made a good digging stick to shift mud from under the frame to under the tire. I called my help to say I might get myself out on my own, but they'd already left so I couldn't reach them. Worried I might just spin the tire and dislodge all my mud instead of getting out, I waited for the tug and never found out if I could get on my own. The car popped out easily with only a dent in the bumper to show for the predicament. One last look out to the ocean, staring into the cloud shrouded afternoon sun.